Fairytale castles, sapphire beaches and gold lined churches are just a few of the wonders waiting to be uncovered in the enchanting country of Portugal. History, art, culture and delicious food collide to create an unforgettable experience for anyone who visits. In recent years, tourism has surged as Portugal has appeared on the map as one of the world’s most incredible destinations to travel to. As a result, we’re here to fill you in on the sights you do not want to miss. From the tourist hotspots to the hidden gems, these are the best places to visit in Portugal. Portugal’s capital Lisbon is renowned for its colour drenched neighbourhoods, cobblestoned laneways and rich historical significance. 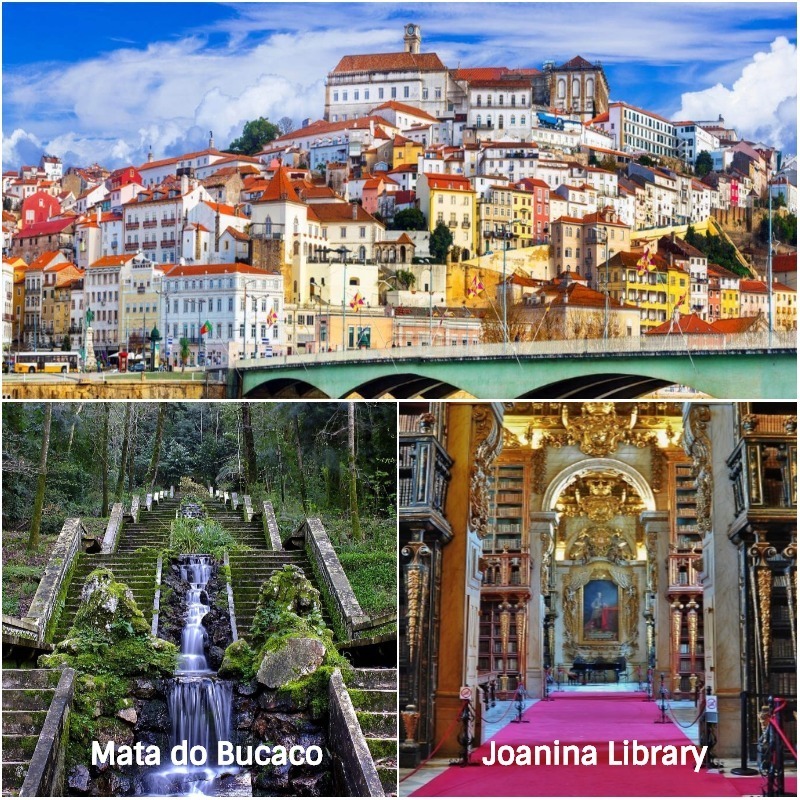 From the charming old Moorish quarter of Alfama to the nightlife district of Bairro Alto, this stunning destination has something for everyone. Indulge in fresh, tantalising seafood while listening to the hypnotic, sombre melodies of a live Fado musician. Finally, finish your visit on an extra sweet note with a taste of one of Portugal’s beloved pastries, the Pastel de Nata. Despite being one of the oldest cities in the world, Lisbon is renowned for its breathtaking street art. Discover these works of art on buildings, laneways and across boardwalks. 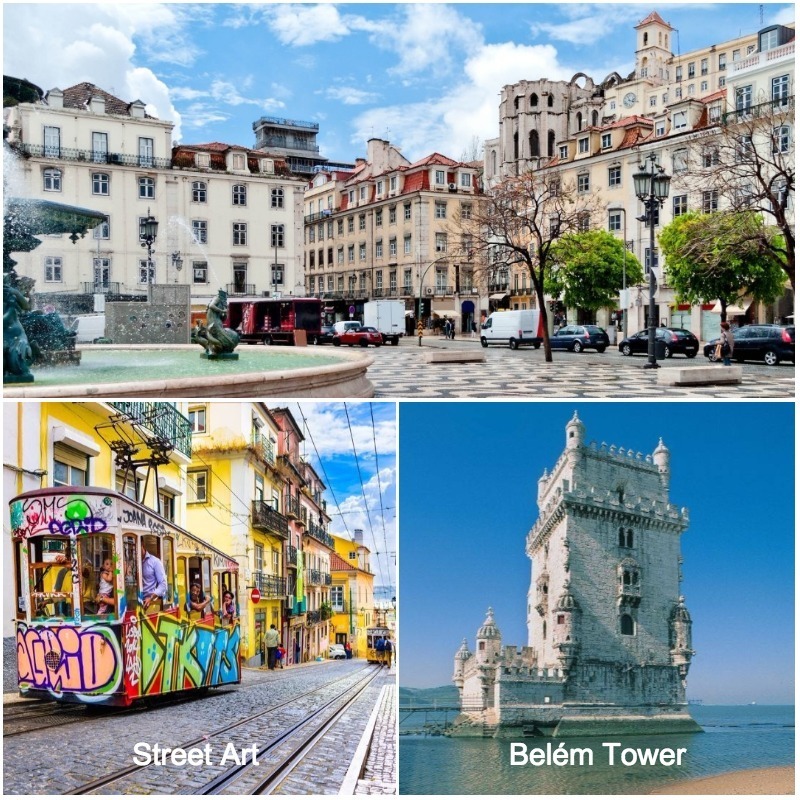 A few places to visit on your artistic exploration of Lisbon include the Calçada da Glória with its famous tram, the Galeria de Arte Urbana, and Santa Apolonia Coastline. Built in the 16th century to guard the entrance to Lisbon’s harbour, this UNESCO world heritage site is a must-visit monument. The tower itself is a masterful example of Venetian, Moorish and Gothic architectural styles, however, for many Portuguese explorers of the time, it was simply their last vision of home as they began their long voyages. Entering Porto is akin to walking into the pages of a fairytale. Located on the Douro River, this stunning city boasts cobblestoned streets and a colourful riverside esplanade. In hidden corners of the city, you will find gilded churches, mouthwatering restaurants and a truly enchanting bookstore. As if this wasn’t enough, it is also the birthplace of port wine. As a result, the wine cellars just across the river along Vila Nova de Gaia are an unmissable addition to any itinerary. Before J.K. Rowling wrote the story of that famous boy wizard, she taught English in Porto. As a result, it is widely rumoured that several aspects of the city appear in her magical tales. 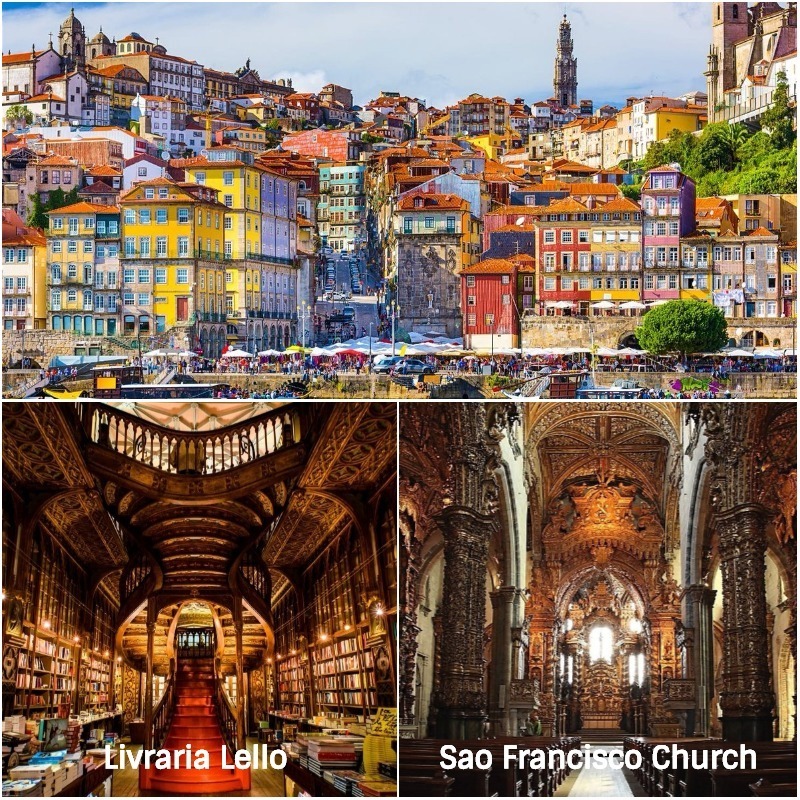 The Livraria Lello bookstore is one of these special destinations. Stepping inside the two-story bookstore, visitors come face to face with a rich, red staircase that appears to engulf guests like a dragon. With its stained glass skylight, carved wooden interior, and collection of more than 60,000 books, it’s not hard to understand why it is one of the most famous bookstores in the world. Don’t let the inconspicuous exterior fool you; behind the demure 14th-century Gothic facade of Sao Francisco Church (Igreja de Sao Francisco) is the entrance to a golden heaven. Following a baroque renovation in the 18th-century, angelic cherubs, monks, flowers and animals cover the gilded walls, which glitter with more than 100kg of gold leaf. If kayaking through caves, glowing sapphire water, panoramic cliffs and a world-famous nightlife scene sound like your idea of a holiday, clear your schedule for a trip to Lagos. Located on the glistening Algarve coastline in Southern Portugal, this relaxed, beach town is picture perfect. Spend your days wandering through the white-washed streets eating fresh seafood before exploring the stunning caves and grottoes. The only issue with this beautiful destination is that after spending a few days in the sun, you won’t want to leave. 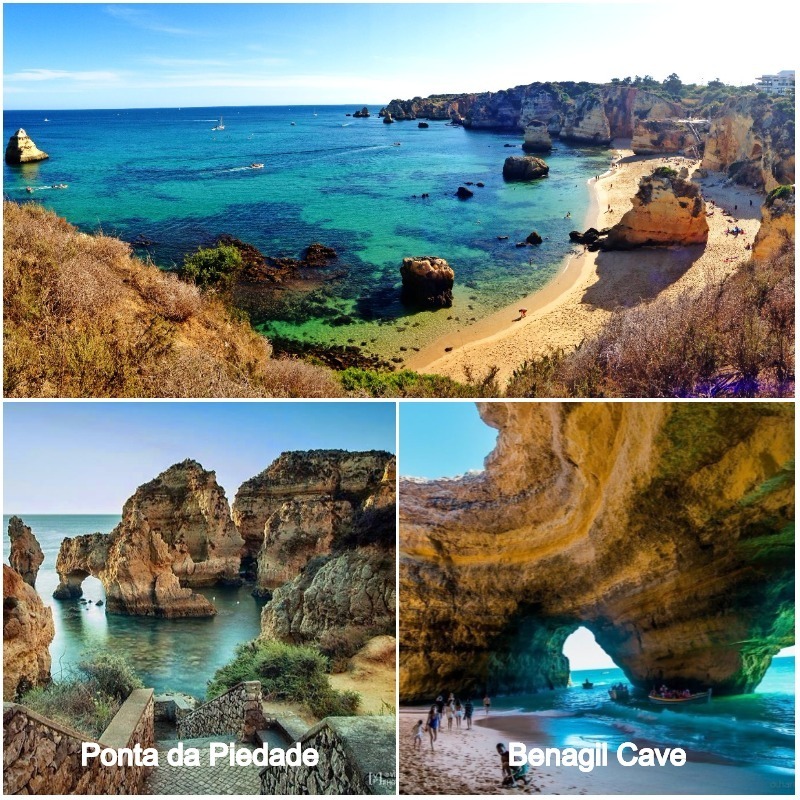 A trip to Lagos is incomplete without a visit to the crystal waters of the Ponta da Piedade. Showcasing nature’s beauty, this coastline is comprised of towering rock pillars, sandstone cliffs, turquoise waves and mystical grottoes. For adventure lovers, explore the Ponta da Piedade in an unforgettable kayak tour. Alternatively, sail across the waters in a small boat or remain on dry land and hike down to the tranquil golden beach. Located just outside of Lagos lies the small fishing village known as Benagil. Travellers venture to this town to catch a glimpse of the famous Benagil Cave. This natural ocean cave is often nicknamed ‘Cathedral Cave’, as a result of its dome-like structure and the illuminating effects of the sun. Featuring a golden, secluded beach, the cave is accessible by kayak or a boat. 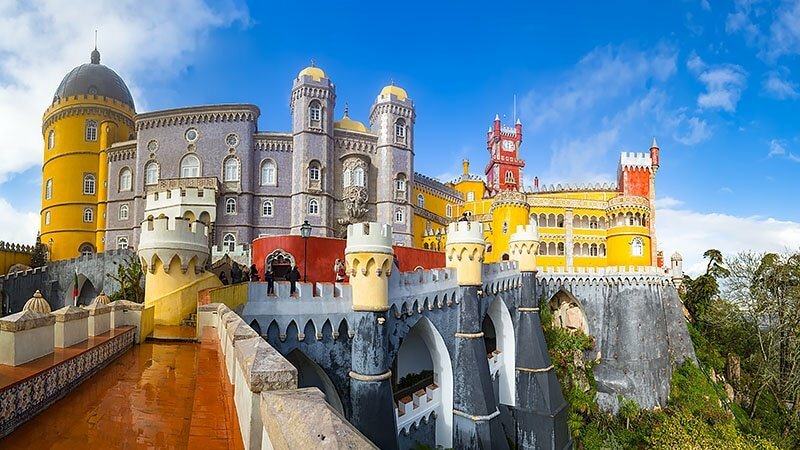 From the towering 8th century Moorish castle, Castelo dos Mouros, to the whimsically colourful 19th century Pena Palace, Sintra is a town that is rich in history, art and culture. Just a 40-minute train ride from Lisbon, this real-life fantasy world is located amongst the sprawling forests of the Serra de Sintra. Extravagant castles and royal palaces sprinkle the lush hills. Meanwhile, the charming town centre bustles with exquisite cafes, unique shops and friendly locals. Although many experience Sintra as a day trip from Lisbon, it is worth staying a night or two to truly explore its beauty. In Portugal, it is a common scenario that mere photos do not do justice to its breathtaking beauty. The Pena Palace is no exception to this fact. Perched amongst the clouds, this flamboyant hilltop palace was built in the height of 19th century Romanticism. In addition to its captivating colour palette, it features mythological statues, unique battlements and stunning lookouts. 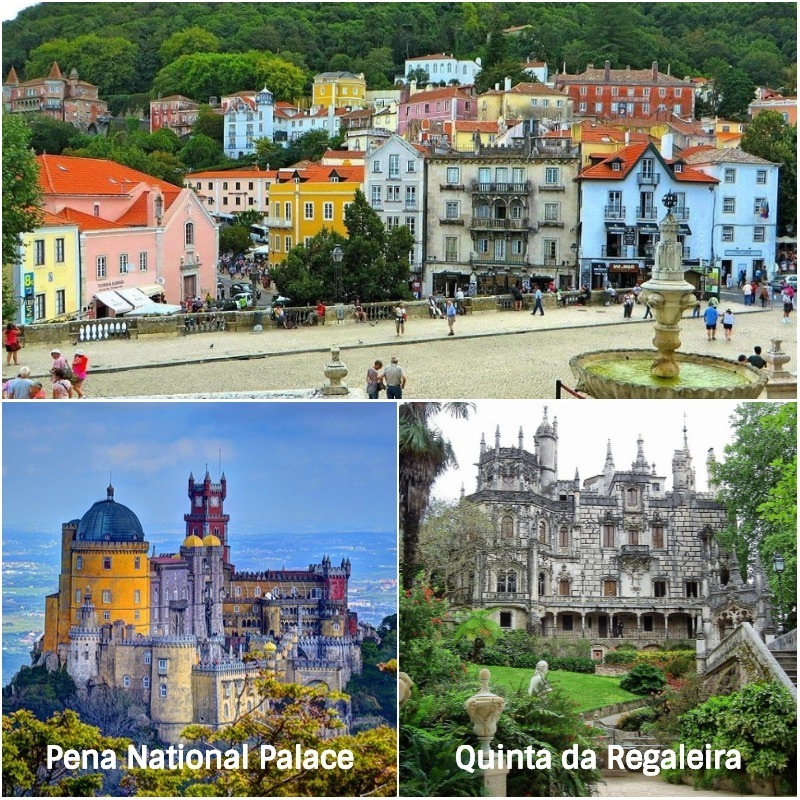 Unlike Sintra’s numerous royal palaces and castles, the Quinta da Regaleira was constructed in the 20th century as a private, luxury residence. This mysterious estate consists of an ornate, gothic mansion and expansive grounds. After discovering the house’s charms, venture out into the gardens to explore hidden, underground tunnels and descend into the spiral-staired ‘Initiation Well’. In these forest gardens, symbolism reigns supreme; you will find hidden, cryptic references to alchemy, the Knights Templar and the Masons. Known to many as the “Floating Garden of the Atlantic” and to others as its “Pearl”, Madeira is a lush island oasis. Just off the coastline, this tropical archipelago resides in the Atlantic ocean between Portugal and Morocco. 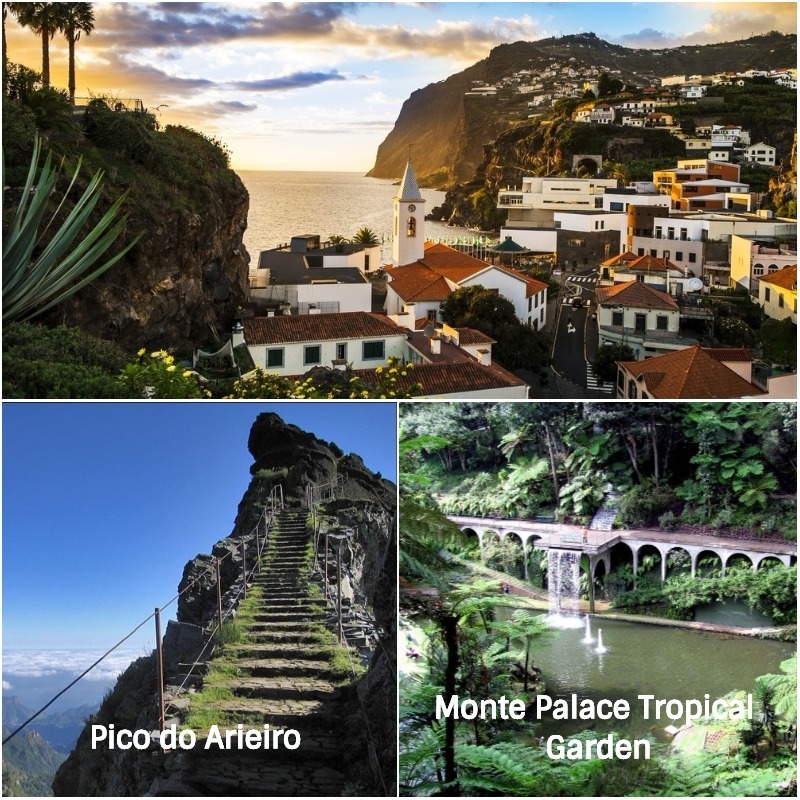 It consists of four islands, including the main island of Madeira where visitors will find mountainscapes that soar above the clouds as well as exotic, green forests. On another of Madeira’s islands, Funchal, you’ll find remarkable churches and fortresses as well as botanical gardens and exclusive resorts. Step into the clouds at the summit of Madeira’s spectacular mountain, Pico do Arieiro. For those looking for an adventure, this hike is for you. The 2-3 hour trek to this sky-high viewpoint will take you through some of Portugal’s most beautiful terrain. Once you are there, climb the rugged steps to the summit to gaze over the tremendous valleys below. With more than 100,000 species of exotic plants, glistening lakes and a collection of living fossils, the Monte Palace Tropical Garden is a gorgeous, natural sanctuary where peacocks, geese and ducks roam freely. If you’re lucky, you may also encounter a black swan from Australia or a frosty white Scandinavian one. In the palace occupying these spacious grounds, visitors will find the Monte Palace Museum. This three-story space is home to an exclusive exhibition of Zimbabwean sculptures as well as a collection of rare minerals from around the world. For over 100 years, Coimbra reigned as Portugal’s medieval capital. Now, it rules as a kaleidoscopically colourful university town, with stunning historical sites and luxurious gardens. In this charming city, relax at one of the many riverside restaurants while enjoying some delicious seafood and the poignant music of the Fado singers. Throughout time, the Mata do Bucaco has been many things. In the 6th century, it was built as a Benedictine hermitage. By the 17th century, it was an estate and in the 19th century, the Bussaco Palace Hotel was built. However, one aspect of this 105-hectare property that has remained the same is the surrounding forest. Rich in heritage, this mystical forest is home to beautiful fountains and more than 250 species of exotic trees and shrubs. Wanderers will explore the convent of Santa Cruz and the steps to the Via Sacra. It also features several viewpoints overlooking the green hills below. Located in the heart of the University of Coimbra, this 18th-century baroque library is one of the world’s most beautiful. As a result, this library, which contains approximately 250,000 books is also a National Monument. Each of its three grand rooms is decorated in baroque fashion, with gilded or painted wooden walls and masterfully painted ceilings. In 1986, the historic haven of Évora became a World Heritage City. For over 2000 years, it has changed hands amongst various empires, as a home to Romans, Moors, Celts and more. 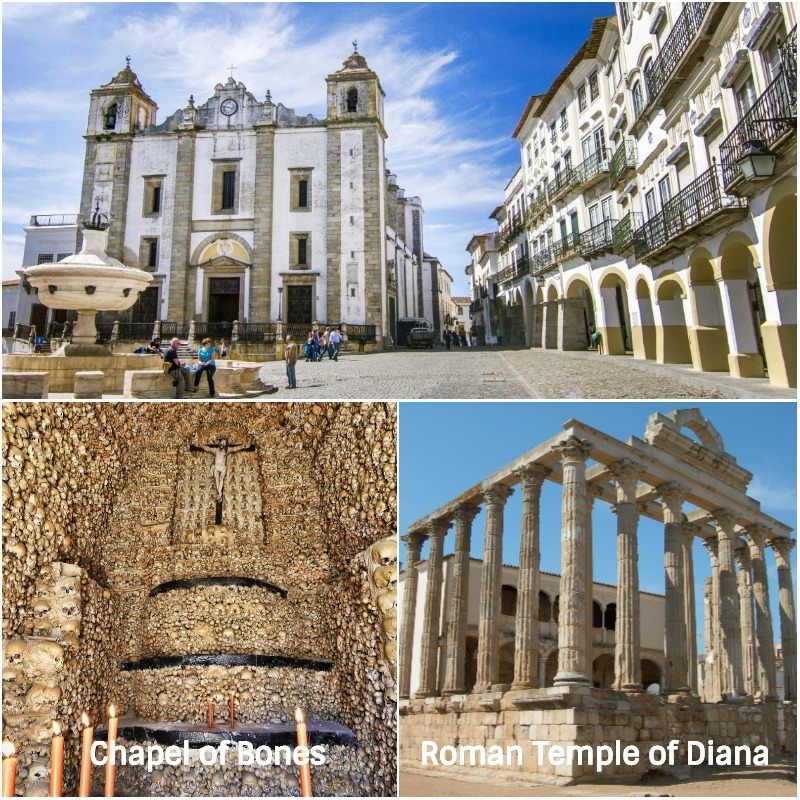 As a result, it is now brimming with cultural and historical sites such as the Temple of Diana, the Cathedral of Évora, a Roman Aqueduct and the eerie Chapel of Bones. Inside the Royal Church of Saint Francis lies the morbidly fascinating Chapel of Bones (Capela dos Ossos). Eerily lined with the skulls and bones of Franciscan monks, this Gothic chapel is believed to hold 5,000 skeletons. Although not recommended for those that get easily spooked, this rare sight is one you won’t soon forget. At the highest point of the city of Évora rests the famous Temple of Diana. By title, the temple is dedicated to the Roman goddess of hunting and the moon. It is believed, however, that this is not its true purpose. Rather, it is said that this 1st-century temple was used to worship the Emperor Augustes. Later, it was converted into a medieval castle and tower. Now, it remains as one of Portugal’s best preserved Roman ruins. Lose yourself in Portuguese’s charming Venetian-esque city, Aveiro. Once a medieval fishing town, it is surrounded by saltwater lagoons and canals. Admire the bright, Art-Noueveau architecture with a cruise along the water in a gondola-style Moliceiro boat. Additionally, a visit to the bustling Praça do Peixe fish market is a must, where you will find an assortment of traditional seafood delicacies. Finally, finish your day off with a trip to Costa Nova beach, which is famous for its vibrant, pin-striped houses. Experience the city from the best possible vantage point – the canals. Hop aboard one of the many vibrant Moliceiro boats for a laidback cruise through this exquisite former fishing port. In another life, these gondola-style boats were used for marine agriculture and seaweed harvesting, however, they now mostly function as tourist cruise vessels. For lovers of seafood, sand and the surf, clear room in your travel schedule for a trip to Costa Nova. 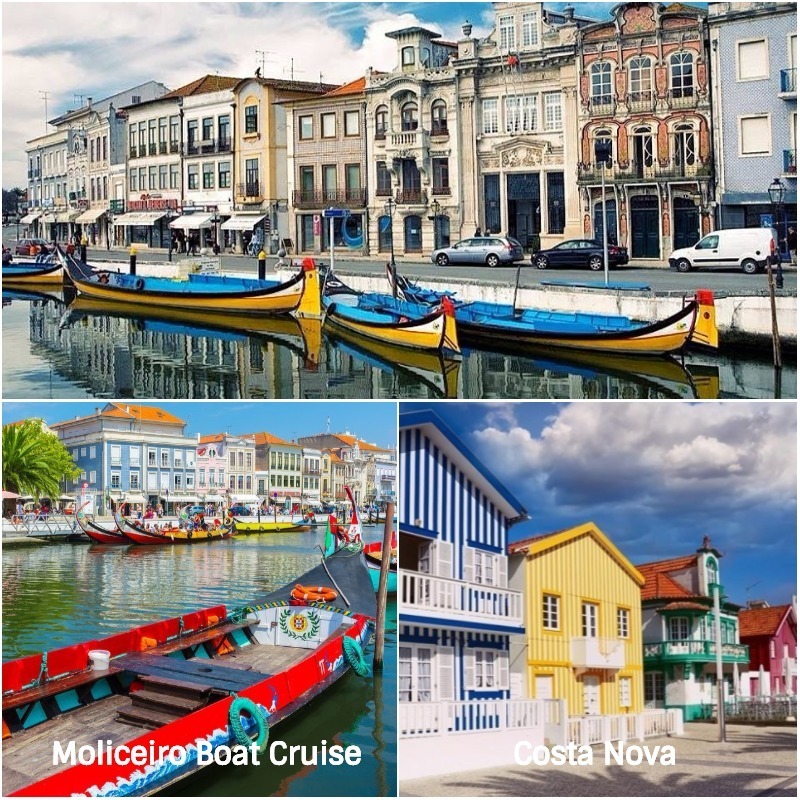 Just a short bus or Moliceiro boat ride from the main centre of Aveiro, Costa Nova boasts a pristine beach lined with candy-coloured striped houses. Additionally, a wide range of water activities including windsurfing, sailing and water-skiing are available for sports-lovers. Finally, if you’re an early bird, make sure to visit the morning fish market for some stunning, fresh seafood.